This fifth generation saw the second major change of direction for the Thunderbird. The Thunderbird had fundamentally remained the same in concept through 1966, even though the styling had been updated twice. 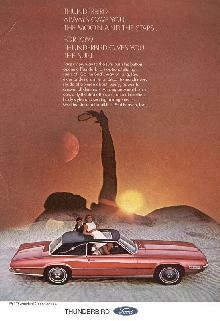 The introduction of the Ford Mustang in early 1964 had, however, challenged the Thunderbird's market positioning. It, like the Thunderbird, was a small, two-door, four-seater with sporting pretensions, but it was substantially cheaper. The Thunderbird's sales suffered. Ford's response was to move the Thunderbird upmarket. For 1967 the Thunderbird would be a larger car, moving it closer to Lincoln as the company chose to emphasise the "luxury" part of the "personal luxury car" designation. Ford chose to abandon the Thunderbird's traditional unibody construction for this larger car, turning to a body-on-frame method with sophisticated rubber mountings between the two to reduce vibration and noise. 1969 Ford Thunderbird sedanThe convertible, increasingly a slow seller, was dropped. Instead, the company introduced a four-door model. The rear doors were hinged on the edge to the rear of the vehicle (suicide doors), as on the 1960s Lincoln Continental. The four-door would remain available through 1971, but never generated substantial sales. The new 1968 Lincoln Continental Mark III was based on the four-door Thunderbird chassis, and from that point until the late Nineties, Thunderbirds and Continental Marks were generally related cars, the Thunderbird following the Mark's growth to enormity in the 1972 model year. The Mercury Cougar also often shared components. The 1967 design was radically different from what came before. Ford's stylists delivered a radical shape that in many ways anticipated the styling trends of the next five years. A gaping wide "fishmouth" front grille that incorporated hidden headlights was the most obvious new feature. The look was clearly influenced by the intakes on jet fighters such as the F-100 Super Sabre, and was enhanced by the flush-fitting front bumper incorporating the bottom "lip" of the "mouth". The sides were the barrel-like "fuselage" style that was very popular during this period. The belt line kicked up "coke-bottle" style after the rear windows, again a styling trait that would prove ubiquitous. Large C-pillars (and a small "formal" rear window on the 4-door) meant poor rear visibility but were the fashion of the time. The taillights spanned the full width of the car, and featured, as in previous Thunderbird models, sequential turn signals. The 1968 Thunderbird saw the introduction of the new 385 series big-block 429 cu in (7 L) engines. Like most Ford motors of the time, they were "underrated" at 360 hp (268 kW) for insurance reasons. The Thunderbird motors also got special treatment with wedge style heads, making a significant power increase over their conventional headed brothers. These motors made the cars some of the quickest and fastest ever produced, despite their larger size and heavier body on frame construction. 1968 and 1969 model years saw minor trim changes respectively. Although sharing the same platform and many of the same parts of the 1967-69 models the 1970 Thunderbird saw a major change to its style: a big eagle's beak out front! Offered in coupe or sports-back models, all 1970-1971 Thunderbirds had prominent angular lines on the hood leading to a jutting tip, that also formed the center of the grill work, that was not a too thinly disguised bird beak. The T-bird for these two years had its most animalistic look that was fairly aggressive in appearance. Semon "Bunkie" Knudsen, the former GM man now President of Ford, is said to be responsible for this dramatic change,. 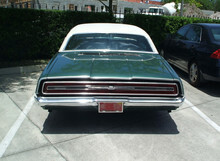 As with the 1967-69 models, the 1970-71 models had sequential turn signals incorporated into the full panel tail lights in the rear of the vehicle.